Israel desperately covets Gaza’s gas as a ‘cheap stop-gap’ yielding revenues of $6-7 billion a year, writes Nafeez Ahmed. The UK’s BG and the US’s Noble Energy are lined up to do the dirty work – but first Hamas must be ‘uprooted’ from Gaza, and Fatah bullied into cutting off its talks with Russia’s Gazprom. Israel’s current offensive in the Gaza Strip is by no means an energy war”, writes Allison Good in The National Interestin a response to myEcologist / Guardianarticle exposing the role of natural gas in Israel’s invasion of Gaza. Yet Good’s missive is full of oversimplifications and distortions. She points out that Israel’s recently discovered Tamar and Leviathan fields together hold an estimated 30 trillion cubic feet of gas – which, she claims “are expected to meet Israel’s domestic energy needs for at least the next twenty-five years” while simultaneously sustaining major exports. “Israel is not using Operation Protective Edge to steal the Gaza Marine gas field from the Palestinians, and it is irresponsible to claim otherwise”, she asserts. Yet her blanket dismissal simply ignores the evidence. In early 2011, Prime Minister Benjamin Netanyahu proposed new negotiations with Palestinian Authority President Mahmoud Abbas Abu-Mazen over development of the Gaza Marine reservoir. “The proposal was made in view of Israel’s natural gas shortage following the cessation of gas deliveries from Egypt”, reported the Israeli business daily Globes. But since 2012, Israel began unilaterally developing the Noa South gas reserve in the Mediterranean off the coast of Gaza, estimated to contain about 1.2 billion cubic metres. Despite repeated breakdowns in Israeli-Palestinian negotiations to exploit the Gaza Marine gas reserves, Israel’s interest only accelerated. In May last year, Israeli officials were in “secret talks” for months with the British Gas Group (BG Group), which owns the license over Gaza’s offshore resources, over development of the reserves. Senior Israeli sources said that the Gaza gas issue was expected to come up in US President Barack Obama’s talks with Israeli leaders during his visit to Israel at the time. The talks also included Netanyahu’s personal envoy Yitzak Molcho and former British Prime Minister Tony Blair in his capacity as Quartet (US, UK, EU, Russia) special envoy to the Middle East. “Israel may now see Gaza Marine as providing a useful alternative source of gas, especially at a time when its pipeline imports from Egypt have been disrupted due to unrest in the Sinai peninsula. “Mr Netanyahu’s government faces criticism and a court challenge from opposition politicians over its plans to export up to 40 per cent of natural gas produced from its own, much larger Mediterranean gas reserves. Why was Netanyahu simultaneously pushing forward negotiations over Gaza’s gas, while also blocking and excluding any deal that would grant any Palestinian entity inclusion in the deal? As noted in my article, and ignored by Noble Energy contractor Allison Good, the drive to access Gaza’s gas was likely magnified in the context of a report by Israeli government chief scientists Sinai Netanyahu and Shlomo Wald of the Energy and Water Resources Ministry. That report was submitted to the Tzemach committee tasked with drafting a national gas policy, but was covered up until Ha’aretz obtained a leaked copy. The Tzemach committee recommended the government to export 53% of its gas – reduced to 40% this June – amidst widespread allegations of “improper conduct” anddeliberate inflation of reserve figures. Indeed, according to the report of the Israeli chief scientists, the government’s gas policy is based on underestimating future Israeli demand and overestimating the country’s gas production potential. The most optimistic estimate received by the Tzemach committee was that Israel would need 364 billion cubic meters of gas. In contrast, the chief scientists argued that by 2040, Israel would need 650 billion cubic meters, after which the country would consume 40 billion cubic meters of gas per year. The upshot is that Israel cannot simultaneously export gas and retain sufficient quantities to meet its domestic needs. These concerns are compounded by the consistent under-performance of several of Israel’s recent gas discoveries compared to the hype, such as in the Sara, Myra, Ishai, and Elijah-3 reserves. Israel needs the Gaza Marine as a stop-gap, but wants it cheap, and is unwilling to exploit the reserves through any Palestinian entity. Official British Foreign Office (FCO) documents obtained under the Freedom of Information Act by the Palestinian think-tank Al-Shabaka based in Washington DC shine new light on this. The biggest obstacle as far as Israel is concerned is Hamas, the Palestinian Authority (PA), and the prospect of a strong independent Palestinian state. After Hamas was elected to power in the Gaza Strip in 2006, the group declared from the outset that Israel’s agreements with the PA were illegitimate, and that Hamas was the rightful owner of the Gaza Marine resources. The plan was, according to an Infrastructures Ministry official cited by the Jerusalem Post, about “circumventing the possibility that Israeli money will end up in the wrong hands”by arranging “a payment plan” that would “completely exclude Hamas”. 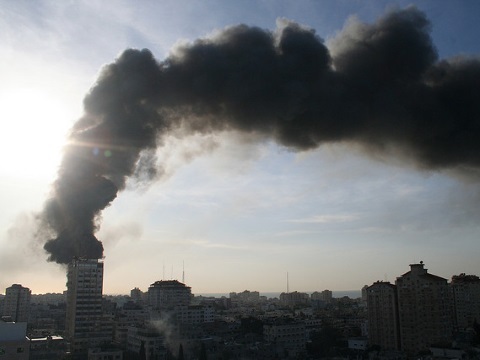 In the same year, incumbent Israeli defence minister Moshe Ya’alon – then former IDF chief of staff – explicitly advocated that the only way in which Gaza’s gas could be developed was through an Israeli military incursion to eliminate Hamas. Ya’alon’s concerns voiced in 2007 – and the prospect of using military force to begin gas production in Gaza – remain relevant today. As the man in charge of Israel’s current war on Gaza, Ya’alon is now in a position to execute the vision he had outlined a year before Operation Cast Lead. Thus, the exclusion of Palestinian representatives – whether Fatah or Hamas – from the latest negotiations between Israel and BG Gas is no accident. While PA president Mahmoud Abbas was independently seeking to reach a deal with Russia’s Gazprom to develop the Gaza Marine, Netanyahu had already “made explicitly clear that he could never, ever, countenance a fully sovereign Palestinian state” – which is why he deliberately torpedoed the peace process, according to US officials. The other factor in this equation is the legal challenge to the Gaza gas proposals fromYam Thetis, a consortium of three Israeli firms and Samedan Oil. Samedan is a subsidiary of the same US oil company, Noble Energy, that employs National Interest contributor Allison Good, and which has been operating in the Noa South field that overlaps Gaza. The upshot is that Noble Energy’s consortium should have the right to extend its drilling into the Gaza Marine on behalf of Israel – and at the expense of the Palestinians. Since the Oslo Accords, although the PA’s maritime jurisdiction extends up to 20 nautical miles from the coast, Israel has incrementally reduced Gaza’s maritime jurisdiction by 85%from 20 to 3 nautical miles – effectively reversing Palestinian sovereignty over the Gaza Marine. But with Israel’s determination to access Gaza’s gas accelerating in the context of the risk of a 2015 energy crunch, the fundamental obstacle to doing so remained not just the intransigent Hamas, but an insufficiently pliant PA seeking to engage the west’s arch-geopolitical rival, Russia. Israel’s own commitment to blocking a two-state solution and bypassing Hamas meant that its only option to bring Gaza’s gas into production was to do so directly – with, it seems, the competing collusion of American and British energy companies. The IDF’s Gaza operation, launched fraudulently in the name of self-defence, is certainly though not exclusively about permanently altering the facts on the ground in Gaza to head-off the PA’s ambitions for autonomously developing the Marine gas reserves, and to eliminate Hamas’ declared sovereignty over them.